The Second Epistle to the Thessalonians, often referred to as Second Thessalonians (US) or Two Thessalonians (UK) (and written 2 Thessalonians) is a book from the New Testament of the Christian Bible. It is traditionally attributed to Paul, as it begins, "Paul, Silvanus, and Timothy, To the church of the Thessalonians" and ends, "I, Paul, write this greeting in my own hand, which is the distinguishing mark in all my letters." Modern scholarship is divided on whether Paul was the author or not; many scholars question its authenticity based on what they see as differences in style and theology between this and the First Epistle to the Thessalonians. Scholars who support its authenticity view it as having been written around 51-52 AD, shortly after the First Epistle. Those who see it as a later composition, assign a date of around 80 - 115 AD. if we only possessed Second Thessalonians few scholars would doubt that Paul wrote it; but when Second Thessalonians is put alongside First Thessalonians then doubts appear. There is a great similarity between the two; this is not only one of words, small phrases and concepts but extends to the total structure of the two letters which is in addition different from what is taken to be the standard Pauline form. At the same time the second letter is alleged to be less intimate and personal in tone than the first, and in some of its teaching, particularly in relation to eschatology, to conflict with the first. The structures of the two letters (to which Best refers) include opening greetings (1 Thess. 1:1, 2 Thess. 1:1–2) and closing benedictions (1 Thess. 5:28, 2 Thess. 3:16d-18) which frame two, balancing, sections (AA'). In 2 Thessalonians these begin with similar successions of nine Greek words, at 1:3 and 2:13. The opening letter section (1:3–2:12) itself comprises two halves, 1:3–12 (where the introductory piece, A, is 1:3–5; the first development, B, is 1:6–10; and the paralleling and concluding development, B', is 1:11–12) and 2:1–12 (with pieces: A 2:1–4, B 2:5–7, B' 2:8–12). The second, balancing, letter section (2:13–3:16c) also comprises two halves: 2:13–3:5 (with pieces: A 2:13–14, B 2:15–17, B' 3:1–5) and 3:6-16c (with pieces: A 3:6–9, B 3:10–12, B' 3:13-16c). Of the twelve pieces in 2 Thessalonians seven begin with 'brother' introductions. Of the eighteen pieces in 1 Thessalonians fourteen begin with 'brother' introductions. In both letters, the sections balance in size and focus, and in many details. In 2 Thessalonians, in 2:5 and 3:10, for example, there is a structural balance of the use of 'when I was with you...' and 'when we were with you...'. Of the books in the New Testament suspected of pseudepigraphy, 2 Thessalonians has the most evidence to support its authenticity. While Paul's authorship of Second Thessalonians has been questioned more often than his authorship of 1 Thess., there is more evidence from early Christian writers for his authorship of Second Thessalonians than for First Thessalonians. The epistle was included in Marcion's canon and the Muratorian fragment; it was mentioned by name by Irenaeus, and quoted by Ignatius, Justin, and Polycarp. Another scholar who argues for the authenticity of this letter is Jerome Murphy-O'Connor. Admitting that there are stylistic problems between Second Thessalonians and First Thessalonians, he argues that part of the problem is due to the composite nature of First Thessalonians (Murphy-O'Connor is only one of many scholars who argue that the current text of Second Thessalonians is the product of merging two or more authentic letters of Paul). 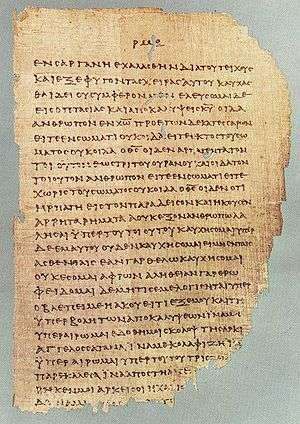 Once the text of this interpolated letter is removed and the two letters compared, Murphy-O'Connor asserts that this objection is "drastically weakened", and concludes, "The arguments against the authenticity of 2 Thessalonians are so weak that it is preferable to accept the traditional ascription of the letter to Paul." Those who believe Paul was the author of Second Thessalonians also note how Paul drew attention to the authenticity of the letter by signing it himself: "I, Paul, write this greeting with my own hand, which is how I write in every letter.". Bruce Metzger writes, "Paul calls attention to his signature, which was added by his own hand as a token of genuineness to every letter of his (3:17)." Other scholars who hold to authenticity include Beale, Green, Jones, Morris, and Witherington. At least as early as 1798, when J.E.C. Schmidt published his opinion, Paul's authorship of this epistle was questioned. More recent challenges to this traditional belief came from scholars such as William Wrede in 1903 and Alfred Loisy in 1933, who challenged the traditional view of the authorship. Many today believe that it was not written by Paul but by an associate or disciple after his death, representing what they believed was his message. See, for example, Ehrman, Gaventa, Smiles, Schnelle, Boring, and Kelly. Norman Perrin observes, "The best understanding of 2 Thessalonians ... is to see it as a deliberate imitation of 1 Thessalonians, updating the apostle's thought.". Perrin bases this claim on his hypothesis that prayer at the time usually treated God the Father as ultimate judge, rather than Jesus. Thessalonica was the second city in Europe where Paul helped to create an organized Christian community. At some point after the first letter was sent, probably soon, some of the Thessalonicans grew concerned over whether those who had died would share in the parousia. This letter was written in response to this concern. The problem then arises, as Raymond Brown points out, whether this letter is an authentic writing of Paul written by one of his followers in his name. If this letter is authentic, then it might have been written soon after Paul's first letter to this community—or possibly years later. Brown notes that Paul "most likely visited Thessalonica several times in his journeys to Macedonia". However, if the letter is not authentic, Brown notes that "in some ways interpretation becomes more complex." Brown believes that the majority of scholars who advocate pseudonymity would place it towards the end of the first century, the same time that Revelation was written. These scholars emphasize the appearance of "man of sin" in the second chapter of this letter, whether this personage is identified with the Antichrist of 1 John and Revelation, or with a historical person like Caligula. The traditional view is that the second epistle to the Thessalonians was probably written from Corinth not many months after the first. Biblical commentator and pastor John Macarthur writes, "The emphasis is on how to maintain a church with an effective testimony in proper response to sound eschatology and obedience to the truth." "We ought always to give thanks to God for you, brethren, as is only fitting, because your faith is greatly enlarged, and the love of each one of you toward one another grows ever greater; therefore, we ourselves speak proudly of you among the churches of God for your perseverance and faith in the midst of all your persecutions and afflictions which you endure" (2 Thess 1:3–5 [NASB]). The letter contains a whole chapter regarding the second advent of Christ, among other themes and instructions. From the inference of 2:1–2, the Thessalonians were faced with a false teaching, saying that Christ had already returned. This error is corrected in chapter 2 (2:1–12), where Paul tells the Thessalonians that a great tribulation must occur before Christ's return. Seeing as how this series of events has not yet happened, his argument reads, Christ cannot have returned yet. He then expresses thanks that his readers were the elect of God, chosen for salvation and saved by His grace through faith, and thus not susceptible to the deception of the "Great Apostasy," (2 Thess 2:13–14) first mentioned here as is the "Katechon" (2 Thess 2:6–7). The letter continues by encouraging the Thessalonian church to stand firm in their faith, and to "keep away from every brother who leads an unruly life and not according to the tradition which you received from us... do not associate with him, so that he will be put to shame. Yet do not regard him as an enemy, but admonish him as a brother" (2 Thess 3:6–7, 14–15). Paul ends this letter by saying, "I, Paul, write this greeting with my own hand, and this is a distinguishing mark in every letter; this is the way I write. The grace of our Lord Jesus Christ be with you all" (2 Thess 3:17–18). Macarthur writes, "Paul added an identifying signature (cf. 1 Cor. 16:21; Col. 4:18) so his readers could be sure he was truly the author." A passage from this book reading "For even when we were with you, this we commanded you, that if any would not work, neither should he eat", (2 Thess. 3:10), was later adapted by Vladimir Lenin as an adage of the Soviet Union, He who does not work, neither shall he eat. ↑ "2 Thessalonians 1 - NRS - Bible Study Tools". Bible Study Tools. ↑ "2 Thessalonians 3 - NRS - Bible Study Tools". Bible Study Tools. ↑ David E. Aune (2010). The Blackwell Companion to The New Testament. Blackwell. p. 517. ISBN 9781405108256. ↑ Earl D. Radmacher, (Th.D. ), Ronald B. Allen (Th.D. ), H. Wayne House, (Th.D., J.D.). "NKJV Study Bible (Second Edition)" p. 1903. ↑ Maarten J.J. Menken (2002). 2 Thessalonians. Routledge. p. 65. ISBN 978-1-134-86748-6. ↑ Leon Morris. Concordia NIV Study Bible. ed. Hoerber, Robert G. St. Louis: Concordia Publishing House, p. 1840. ↑ Metzger, Bruce M. (2003). The New Testament: Its Background, Growth, & Content. 3rd ed. Nashville: Abingdon, p. 255.